The mostly widely adopted technology by the professional printing community is the Inkjet printer technology. Laser printing is able to outperforming Inkjet printing in terms of speed, but it lacks the accuracy that high quality photographs require. Laser uses melted powder-like substance in CMYK colours, while Inkjet uses the same colours though liquid ink form that are delivered to the paper by means of small jets (hence Ink-Jet). This method of printing can achieve 2880Dpi vs. 720Dpi commonly found in laser printers. Therefore from here on, the various parameters for choosing photo paper will refer to the Inkjet type. Most printers will support universal compatibility. The fact that you own a major manufacturer’s brand of printer does not limit you to its range of printed media. For example, an HP printer will naturally support its range of papers as well as these papers produced by other manufacturers. The difference lies in the setting part of the printing process, in which you have to decide on paper size, quality, finish and other printing attributes. Choosing your own printer’s brand of paper will mean that settings are pre-configured, though do not let this put you off from considering other brands. Many manufacturers and particularly the professional niche players the likes of Ilford, Hahnemuehle, Innova, etc. are able to provide you with a colour profile file. This computerized file will adjust the printer settings for you. During your research, keep an open mind as to your options and consider photo paper from various brands as long as they meet your criteria. The first aspect that consumers often evaluate is the photo paper finish. It is a translucent chemical coating that is designed to improve the appearance of the print which otherwise may appear dull. The problem lies in the inconsistent terminology that brands use to describe their finish and the headache of making sense of which is which. Common options include matt, glossy and satin, but when consumers come across terms such as semi-gloss, pearl, luster and other finishes, confusion is likely to occur. Here are the most common options you will come across. Glossy – The most widely used finish is the glossy finish which comes in degree of glossiness from normal to high glossy. The shine from the chemical coating helps distinguish the smallest details of the photograph, however the resulting glare makes viewing the print from certain angles challenging on occasion. Matt – Depending on the brand, you will come across this finish as Matt or Matte. It is situated on the other side of the scale with zero glossiness. The lack of expensive finish makes the photo paper slightly cheaper to produce and more affordable to buy which helps explain why it is commonly used in brochure and flyer printing. It is also commonly used when printing black and white photos, as glossy finish can diminish from the photo’s credibility. Satin – The satin finish is situated precisely in the middle, between the glossy and matt finish. It benefits from a level of glossiness, but nowhere near that of the actual glossy finish. Certain brands such as Epson call their range of satin finish “semi-gloss” so the best description will be a toned down glossy finish. Pearl and Luster – These are offered by the more professional manufactures and represent a type of satin finish with a textured feel. The normal satin or semi-gloss finish is flat, but these two include a delicate texture to make the print feel more special when held. Cast Coated Receiving Layer – The cast coated receiving layer is commonly found in the budget and “Every Day” range of the various manufacturers. It yields satisfactory results, but often may appear slightly duller than the Micro Porous alternative. Because there is no barrier coating on the paper, ink sinks deeper into the product and will fade quicker with time. Cast coated paper is instant dry, but if pigmented inks are used (especially black), may be susceptible to some smearing. Cast Coatings have limited archival properties. Micro and Nano Pores Receiving Layers – These two are the ones used in the professional and high-end range of the various manufacturers. In complete contrast to the previous type, the ink sits within nanoscopic pores in the chemical so it dries instantly and the archival potential is much improved. It is the receiving layer choice of most photographers. The last consideration that consumers are faced with is the weight of the paper measured in GSM or, if you will, the weight of paper per one square meter of area. Contrary to what you might think, GSM does not equal quality of print but higher GSM leads to thicker photo paper which at times can be useful but, at other times, a waste of money. As a measure of paper density, higher GSM weight feels thicker when held hence you will often come across greeting card papers boasting GSM weight on the high end of the spectrum, while prints with low keepsake potential such as brochures that will likely be discarded quite quickly will feature more modest GSM weight. 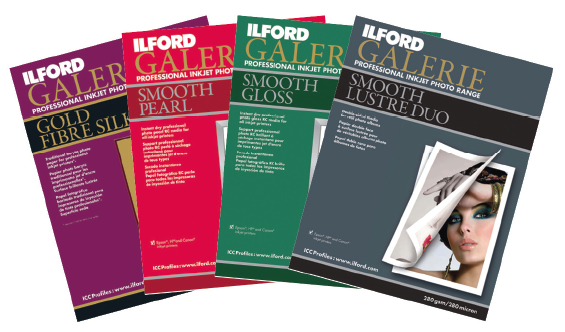 We hope this has helped you in evaluating your photographic photo paper options. This guest post was written by Joseph Eitan, the managing director of Photo Paper Direct. Joseph has over 25 years experience working in the paper and printing industry as the managing director of several companies. Excellent post. Thank you. Can you please detail on selection of printers? ??? Very interesting post but I would like to add something from own experience. Not all high quality paper coatings are compatible with all inks. Problems like “bronzing” can occur if the ink does not absorb properly. After careful research and consultation with a supplier I once bought a roll of expensive Kodak paper to use with the Canon i9100 printer I was using at the time. The plan was to cut long strips and print some panoramas. I experienced severe bronzing (shiny metallic lustre) in the areas where dark colours were printed. It reduced after a few days but never totally went away. Any advice on how to tell (other than trying a sample) if a paper is compatible with a particular printer’s ink? Also, any comments on dye and pigment based inks and how to select papers for them? Thanks for that link. It was quite some years ago that I had the bronzing problem so perhaps the technology has moved on. If you’re looking for a recommendation for a printer, try the Canon Pro 1. It’s fantastic! Good to understand which paper best reflects hard-earned photographs. Surprised by degree of superiority of inkjet over laser! Thanks for posting. This was my profession for 7 years. I developed inject inks and solution up to 360 square meter / h printing speed. So I am indeed professional for this subject. For “basic solution” 4 colors CMYK is enough. For special use additional colors is required. We developed solution and inks up to 8 colors. One of the special printers that we developed in an international collaboration used 10 colors (The printer price was 400k Euro!!!). I was the responsible to develop the ink for this special inject printer. Especially for pigmented water base inks, extra colors need to cover the color space. The most critical part of the color space can be found between the yellow and magenta. Sometimes this part should be reinforce with additional colors such as orange or “Ferrari” red since mixing yellow and magenta could not provide the correct vivid colors in question. Another important factor is the droplets volume. In some solutions the droplet volume is fixed in some solutions the droplets volume is variable. Generally the droplet volume is between 8 and 80 pL (pico liter). There are several print head s too. I worked with Epson (my preferred head), Kodak (very expensive but it is really the flagship), Fuji Dimatix (extremely solid printhead). The price range of the printheads can be found :100-4000$. Thanks for sharing your knowledge, interesting indeed. 1- As a professionnal in inks for inkjets printers can you tell us if its true or false that inks sold to replace the original inks from no name companies can clogged faster or even worst shorten considerably the life expentancy of the printerheads ? 2- Do you have any tricks to unclogged severely clogged printerheads, and when should we replace them and should we clean them regularly in hot distilled water as a maintenance procedure ? PS: I own a canon S9000 that I can not unclogged many of its heads even after trying with a seringe and a tube to force hot distilled water isopropyl alcool and even bleach. The bad thing is this printerhead is not to be found on internet or with canon. I am stucked with 200$ of inks for that printer. 1. The premium ink companies have very serious QC. I am not allowed to post any of these QC test methods but you can believe me that the acceptance criteria were extremely strict. In addition, some prinhead producers require also validating (qualifying) the ink according to their procedure. I mean, any ink producing companies could produce ink for the printhead but the label on printhead producer approved ink was allowed to use if it underwent this qualification procedure by the printherad producer in their test labors. I cannot tell you that no-name companies do not have similar QC requirement. Developing a series of ink is long and expensive process. Obviously you can find good quality cheap ink as well. I can tell you only that the premium inks are well tested and the QC is strict especially if it is qualified also by the printhead producer. Clogging is a typical ink problem. A lots of parameters play role in this procedure including fast drying vs. environmental conditions or ink storage stability problem such as emulsion / suspension stability problem or inadequate transport. You can imagine a scenario, the ink is developed in a Mediterranean country under Mediterranean conditions and suddenly it clogs printheads in Canada during the winter. Premium inks are tested for all these environments and meteorology conditions (OK not for Antarctic conditions either for tropical rain forest application). A no-name ink producing company might test it as well but keeping low price somewhere the cost should be cut. If the raw material cost is cut, if the raw material processing costs are cut, if the satisfactory production cost is cut, if the QC costs are cut, if the qualification test costs are cut etc. the result would be a low quality fast clogging ink who reduce the life of the printhead. Using no-name ink is typically a benefit / risk consideration. During my last year at that company I was in the customer service. I met big printing companies who preferred using no-name cheap inks. Taking account the potential clogging vs. cost they decided to take risk to use no-name ink since the cost benefit was promising. After one year this hypotheses failed. The PH replacement cost was much higher that they expected in spite of their procurement negotiated very well with the PH producing company to purchase replacement PHs. They returned to premium inks. They did not consumed only some inject cartouche they purchased some tons of ink per year. 2. If a PH is dead it is dead. Clock cannot be removed. You can try to clean it with ultrasound bath if the printer cleaning cycle does not provide result. My experience (which bases on roughly 500-600 dead printhead) only 1 PH can be saved from 10 with ultrasounification. Use an ultrasound bath at room temperature, filled with strong aqueous detergent solution for 10 min. By the way the canon PH. I use also canon printer at home but I was never able to dismount it. I tried it but it was built like a tank. The message was clear for me. If it breaks you shall buy a new one. I am not convinced if it is indeed canon produced PH. I have a feeling that canon only label a licensed product. Thanks Laszlo for your very interesting and instructive thoughts . My canon s9000 printhead contains 6 colors and has the canon number QY6-0039-000. it is easely detachable from the printer after having pulled out the six small (18 ml) colored ink tanks. As far as taking it completely apart there are 2 small screws that seems to be glued at the bottom of the PH, preventing separating the head assembly to the tank reservoir holder above it. One thing that that is not clear, should we regularly such as in my case where I can be long period (months) of time without using the printer clean the PH in an aquous solution as a preventive way to stop clogging from happening ? I plan to buy the Canon pixma pro-10 or pro-1 to replace my S9000 and would like to keep it for a long time without spending big money on service in the long run. Even the best ink coagulates in time. The best way to keep injet PH in good state is to clean the head from the ink or replace the ink to cleaning solution (soap etc) if it is not used for longer time. Great post as always. What would be YOUR preferred paper type and brand for fine art quality black and white wildlife photography? 11×18 or higher size. I’m having difficulty figuring out from the plethora of choices available. Thanks! Good question. I would recommend a 100% photo rag smooth white matt photo art or the baryta/cotton acid free based photo papers. It is often a question of trying a few and evaluating the results as the difference in texture is down to personal taste. Some brands offer a sample pack, worth looking for one. Hahnemuehle and Innova offer a wide range of weights and sizes. Great articles, great analyse ! Can anyone tell me if inkjet papers can be dry-mounted in the same way as traditional silver-halide papers. Can someone tell me if inkjet papers can be fixed to mounting board by traditional dry-mounting in the same way as old-style silver halide papers? Hi, dry mounting will work on the microporous papers due to the polyethylene (PE) coated on the reverse side. I hope this helps. OMG!!! writing about papers, I can´t belive it. Maybe some people need it for research for their science fair project to try to get an A. Calm down. I use Ilford premium plus pearl paper as my preferred paper on my Epson R3000. It is good value for money because the store nearby is also the nearest shop to a large Institute of Technology. Students there seem to buy a lot of print paper and the ILFORD range is always in stock in a range of sizes and there are often some good prices. The PREMIUM PLUS PEARL seems to be well priced and produces very results. One issue is that the R3000 prints slightly darker than expected regardless of calibrations and no matter which paper I use. I use the print controls in Aperture to adjust the final output. Once I got it right I saved the adjustment setting. I do like the ILFORD range better than the Epson gloss or matte. I always use genuine inks because I have never seen any cheap ink for my R3000. The same shop is great on ink supplies and even better if you buy a full set (8 inks) at a time. I am not really interested in 3rd party inks until I have solid evidence that clogging will not happen and colours will not change. I mount my images behind glass (2mm frosted). Did you calibrate your LCD screen with a special device prior to printing and do you use ICC profiles for your different paper brands ? A device like the spyder 3 elite fron Datacolor will set your screen colors to meet the different standard such as sRGB and you will be able to create a profile for your LCD display that will load everytime you start your PC. If your LCD is by default too bright it will make you set your image too dark at the printer. My canon s9000 never made prints brightness different than my screen setting after using this device, and the colors appeared closed to the monitor colors. This is a known feature of the printer. I do use the ICC profiles but have not used a spyder. For the moment the settings seem to able compensate. I would be grateful for your suggestions. I have looked at the cost of the Spyder4elite following your post and am considering my options. I tested several Luster papers for my Epson 3880 printer because I needed a luster paper in the 4×6 and 5×7 sizes and Epson does not make those sizes for some unexplained reason. I settled on the Ilford Smooth Pearl and I love it because the print quality is excellent with good color and really good resolution because the surface is slightly smoother than the luster papers and it is also a heavy paper which lends a professionalism to the presentation that thinner papers just don’t. I did learn something interesting in my testing and that is that the Epson Luster paper will yield better results with the Ilford Luster color profile than it will with the Epson profile. I found that the Ilford profile gives better shadow detail and better color in the shadows. My point is that if you are going to test papers, you might want to cross test the papers with a number of different color profiles. You might find that a paper you are using now can be made better with another manufacturer’s color profile. Good luck and best regards everyone. I just bought an epson pro 3880 for Christmas, I added over 200 sheets of epson ultra premium glossy photo paper (100 8.5X11., 200 4X6 Premium photo paper, 160 5X7 Premium glossy ), because they were sold at half price. I am so amazed at the quality this printer prints, but I am also very worried of head cloggings for low production work. Do you have any comments other than printing every week ?, if so I would like to read your recommandations and your experience with the 3880. What do you think of using a Color Munki or use a spider3print to create .icc profiles for different papers ?. Did you ever use inks from inkjetmall in vermont ? Epson says that you should turn the printer off when you aren’t using it and that will help keep the print heads from clogging. When you turn the printer off the print head carriage parks itself in such a way that the surface of the heads is resting against something that more or less seals them off preventing them from drying out, sealing in the freshness as it were. This only happens when the printer is turned off and not just merely resting. My 3880 turns itself off automatically overnight which is an Epson software setting. If I’m printing a lot I turn that feature off, leaving the printer on all the time. I’m not sure how much if any ink is wasted every time you turn the printer back on but it’s an interesting question. I know that manufacturer’s profiles can be flawed because I have tested various papers using various different profiles and have seen interesting results but I think that the Ilford profiles are excellent. I have been told however by a few people I trust that I should make paper profiles because I would get even better results. I’m curious enough to plan on buying the Spider print profiler sometime this Spring. I have spoken to the person at Spider who is in charge of that piece of gear and he seems to really know his stuff and I know that having those types of relationships can transform the experience of using a particular piece of equipment. I have not used the Jon Cohen ink because I like the convenience of just buying the Epson carts with no fuss involved. I met Jon Cohen some years ago though and I am convinced that he knows more about scanning and printing than anyone else alive and I trust that his ink is fantastic. He showed me a black and white inkjet print he made years ago on an Epson printer with black and only three dilutions of gray inks and it was the most incredible black and white inkjet print I have ever seen and maybe just the best black and white print of any type that I have ever seen. As far as the 3880 goes, there really isn’t that much that can go wrong. Just be aware that when you switch from Matt to Glossy or back the printer does have to waste several milliliters or ink that will cost you a few dollars each time so plan accordingly. I say that you should experiment with different papers and really experience how they can really change your images. The different papers are just more tools at your disposal, like different lenses are. You have to know that thicker papers require different platen settings which you can research in the printer manual. It’s easy but you have to know about it. Good luck. Thanks a lot for your comments. I asked you about Jon Cone beacuse I have spent als close to 600$ of inks (Ink Thrift 220 ml, ConeColor Pro 110 ml), PIezoFlush 700 ml ) and fill carts (2 sets) from Jon. I am not sure if I will use them during my first year epson warranty. Regarding inkjet papers, I have a box of 5 X 7 HP glossy photo paper, I am using Epson 1400. I need to get the ICC profile for this paper from HP, I tried, could not find any link from HP Official site, If I use printing managed by Epson printer, the result is not satisfy at all, could you help. The problem is that HP sells printers too and they don’t want you to use an Epson printer so they aren’t going to give you a color profile allowing you to do so. Epson isn’t going to give you a profile for HP paper either because they want you to only use Epson papers with your 1400. That is your problem. If you check around on line you will be able to find people who will make a profile for you for a price. My feeling is that it is not worth the cost because you only have a small amount of that paper. The easiest way to deal with your problem is to get another brand of paper, maybe even Epson paper which is your easiest solution. I know it seems wasteful. You can try to download many other manufacturers glossy paper profiles but you are going to use up all of your paper just testing all of the profiles. Sorry. Thanks, this is what I think, Epson has a site disclosing all their paper colour profiles. HP no, I used Epson UPSP profile for several test prints, the result looks better, still has light greyish, not match with Epson paper, or Moab papers ( I downloaded Moab profile) Will not buy HP papers in future. The Kirland paper from Costco are very good too when using Epson PGPP profile. Nice post! Thanks for such great ideas for the selection of photographic paper. Best consolidation of to-the-point info on the subject I’ve found so far. Thanks! I need yr kind advise. I hv HP Deskjet Ink Advantage 3515 printer. Today I tried to use Kodak Hi Gloss 180 g/m2 (230 microns, 9.1 mil) paper but it does not fit into my printer. It is thicker. Pls advise which High Gloss paper, the thickness size I shud use in the abv printer ? I would like to know where can i get the traditional silver halide photo paper in UAE? Amazing works, I like your photography . Thanks for sharing. My name is Anthony Afterwit and I run “Go Inkjet” in Standish, Wigan(UK). My site “http://www.goinkjet.co.uk/” hosts many visitors per month and I enhance customer-engagement by reaching out to other bloggers. Therefore, I have visited your site and found the blogs really worth reading. The quality of your content is so good that it made me request you something. I’m interested in writing a guest post for you regarding professional wedding photography — something you’ve never posted on. If you give me this opportunity, I’ll mail you a blog in impeccable grammar, on time and in any format you prefer. I am experienced with WordPress and HTML.I know you’re busy, so I can write everything up and send it to you in one document, which you can drop right into WordPress. I’ll handle all editing, bylines, etc (feel free to edit) so that it becomes super-easy for you. In addition, I promise the guest posts will get your readers provided with valuable information and making them discuss on relevant points. In response, I expect you to give me a back-link who helps me to continue my passion and serve individual sites and blogs like yours. You really are a deep source of knowledge when it comes to printing on photo paper. I have a slightly different angle: is it possible to print regular text on photo paper on a “regular” color laser jet printer? Or will the photo paper show some kind of chemical reaction and fade or discolor over time if it’s framed and exhibited on a wall, for instance? Nice blog I found from your side. Very informative article. Our company Geek Squad Webroot provides service mobile end devices, tablets, PCs, laptops exploitation Windows or Mac software. For any technical help call our toll free number or visit our website for more information. What are options for quality inkjet printer photo paper that doesn’t have any logos on the back? Specifically I’m looking to print Actor theatrical headshots on them.